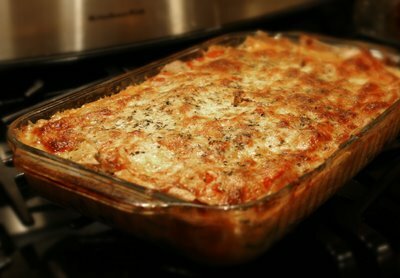 This lasagna recipe was inspired by a recent visit to Colorado Grown where Amy of Cottonwood Creek Dairy fame was selling freshly made ricotta cheese. The recipe has a surprising number of locally produced ingredients as well as a very elegant taste. Measure and pour flour onto a clean work surface and create a well in the center. Crack the eggs into the well and beat them lightly with a fork. Using your finger, stir the egg and gradually incorporate all of the flour into the mixture. The dough should be smooth and not too stiff. Have a spray bottle filled with water on hand if you need to add more moisture to the dough. Knead for about 10 minutes or until elastic. Wrap the dough and allow it to rest for 30 minutes. Roll out ½ of dough on a lightly floured surface. Rotating the dough ¼ turn as you work, continue until it is about 1/8 inch thick. Once you get to this point, you will need to stretch the dough to your desired thickness. (See Joy of Cooking for a nice explanation of this process.) Cut the pasta into 4” wide lasagna strips and allow to dry for an hour before cooking. Heat olive oil in a large skillet. Add garlic and onion. Cook until browned, remove from skillet and set aside. Remove sausage from their casings and place in hot skillet. Add mushrooms. After the sausage is cooked, add the onion and marinara sauce. Heat throughout. In a medium bowl, combine the ricotta, spinach, eggs, and salt and pepper to taste, leaving the mozzarella separate. Set aside. Cook pasta in salted water until it is slightly underdone. Drain. Butter a 13 x 9 inch baking dish. Layer the bottom with lasagna, half of the ricotta mixture, 1/3 of the sausage mixture, and 1/3 of the mozzarella. Repeat. Top with remaining lasagna, sausage mixture, and mozzarella. Bake uncovered for 30 to 40 minutes until the cheese is melted and golden.